Denis Paré, our 2013 “Socio-Hero"
The Drummondville community is fortunate to count an individual as dedicated as Denis Paré among its citizens. Three of his colleagues at Norampac – Drummondville, Julie Martel, Line Lambert and Maria-Gorete Rodrigues, realized this, and they each nominated him for the Social Hero contest independently! Denis is a die cutting machine operator and the father of three children. He is very involved in his community, mainly for the Centre Normand-Léveillé in Drummondville, which serves as a place of respite and holiday for people with intellectual, physical or sensory disabilities. Two or three days every week, the Cascader helps maintain the premises, accompany disabled people in their reintegration and design, develop and realize large-scale projects for the Centre. In addition to his 12-hour work shifts, Denis volunteers like a madman trying to find funding for his grand dreams and turning them into realities. The driving force behind his actions is the smiles of wonder inspired by his projects large and small. To date, he has built a fitness trail that’s not only adapted to the Centre’s needs, but also doubles as an attraction for nearby schools’ outdoor classes. And that’s not all! Denis also drew plans for a mini-farm and supervised its construction. The farm’s small animals will provide welcome stimulation for the Centre’s clients. The Social Hero is now pouring his energy into another promising project: the storytelling tree. The plans have been drawn up and the structure is being built. The storytelling tree, which is officially expected for summer 2014, is made up of an agora with a stage featuring a lighted mechanical tree that will tell stories to the Centre’s people. 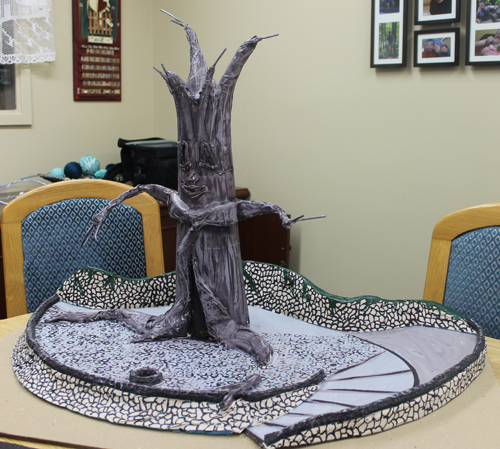 The tree will be used to promote reading and to capture the interest for stories of people with disabilities. This impressive tree structure will also contain a library accessible to residents of the Centre. Denis is really doing everything in his power to make people’s stay as entertaining as possible. Despite working on this colossal project, the Cascader is also involved in several organizing committees for various causes. Over the past 20 years, he became involved in the setting up of around fifteen Christmas celebrations for the office, but also for his colleagues’ children. During the summer, Denis helps organize the “Golf sous les étoiles” (Golfing beneath the stars) golf tournament for the benefit of the Centre Communautaire Pierre-Lemaire, which offers courses, workshops and training for people of all ages living in Drummondville. Of course, he works every year to organize the Centre Normand-Léveillé’s benefit golf tournament. The Social Hero also donates his time to put together his town’s great Saint-Jean-Baptiste celebration, to prepare a camp for the “Relay For Life” fundraising walk and to accompany teenagers aged 12–15 on Quebec–Alberta cultural exchanges. Denis is a dear friend, a dedicated colleague and a model citizen—an example of remarkable generosity we can all draw inspiration from. He gave his $1,000 cheque to the Centre Normand-Léveillé, since the storytelling tree project is close to his heart. In the words of his colleague Line Lambert: “Giving some of your time is a very nice thing to do; we all know how fast life moves these days. Taking the time to donate time is a rare treasure in 2013.” Denis, congratulations for your outstanding contribution to your community!